We found this tree while driving through the Rocky Mountains. Its tap roots must be very long in order to find water through the rocks. This aspen tree demonstrates the qualities of tenacity. The word tenacious comes from the Latin tenac, which means “tending to hold fast.” Synonyms for tenacity include stubbornness, obstinacy, resolve, drive, determination, and courage. We writers show the same qualities; we must. How else to explain why we continue to write when books don’t sell well, when negative reviews are received, and when it seems no one in the forest is listening. 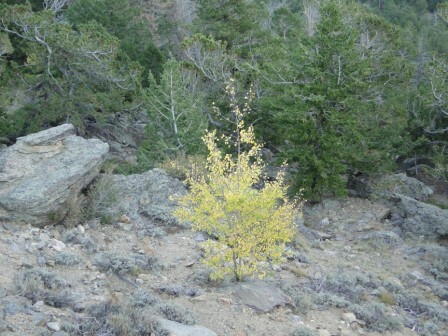 It’s also an isolated occupation, just as this lone aspen in the rock demonstrates. Yet when we tap into those reserves deep within us, pure magic occurs. This happened to me this past week when I completed the final draft of my new novel. For the first time, I felt a deep satisfaction in what I had accomplished for no other reason than I finished the book, and I like the result. I’ve probably thought too much about what others might think of my books in the past, but this one – the first I’ve been able to write full time – gave me an inner satisfaction. It would be nice if others like it, too, but it doesn’t really matter. I showed to myself what I could do. I stuck with it despite any monetary gain or pats of the back from an adoring public. I let my tap roots go deep, and the pay off came when I finished reading the last line and discovered tears on my face – tears of joy. The story moved me, even though I created it. The discovery of finding that source within me will keep me going until I meet the next challenge. Right now I’m glowing as much as this little aspen tree in Colorado. On the wall behind me, I have two plaques describing my astrological sign of Capricorn. One lists these attributes of the goat: stubborn, never satisfied, insatiable, unmovable. The other one lists these: determined, hard-working, resourceful, thoughtful, organized, patient. I chose the right/write career, but there are days when I suspect this career chose me. Thank goodness for my tenacious nature. How about you? Do you feel this career is well suited for your personality? This entry was posted in Ramblings of a Writer and tagged aspen tree, astrological signs, capricorn, career, Colorado, tenacity, writers, writing. Bookmark the permalink. What a beautiful analogy. And best wishes on your book. As for me, I was apparently born to be a writer. I tried to fight it. I had two other majors in college before God forced me on the path He chose for me originally. I don’t know why I didn’t just accept it from the start. Probably because everyone told me I couldn’t make a living as a writer. (Possibly true for an author; not true as a writer.) Once I settled on becoming a writer, things just kind of clicked. I’m doing what I’m good at, and I’m doing what I love. It doesn’t get better than that. That’s wonderful, Staci. Most days I feel the same way. When it clicked for me, everything fell into place. Thanks for reminding us that God always directs us in the right direction. We just have to open our eyes and follow. What a lovely photo and a perfect analogy. It does take strength, courage, and tenacity to keep writing, even when things look bleak. Thank you for sharing this inspiring, encouraging post and congrats on completing the final draft of your new novel. Thank you, Reese. Some days are more challenging than others, but we have to keep plodding along. Thanks for stopping by.